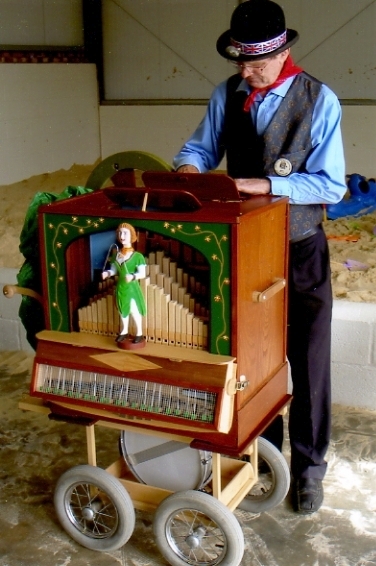 Topsy 3 is what John personally considers to be his ultimate portable organ. In the first six months of its life, it has received extensive acclaim from several top organ enthusiasts - and many requests for plans. John has developed the construction methods used over about twenty five years of organ building. These methods have come in for many criticisms over the years, but with this set of plans he is presenting them quite unashamedly, as the results achieved are excellent, both for him and for others. His main aims for any of his organs are: excellent performance, ease and economy of construction, durability and reliability, easy turning, and light weight. This organ has delivered the lot, plus a bit more! Even the basic weight of only 68 lbs is amazing for an organ with such a specification. One extra requirement that was suggested, was that it should fit through the door of a caravan. This limitation, and the desire to reduce the weight of the organ itself, is the reason for the Glockenspiel being detachable. Topsy 3 has a very full specification: 68 effective MIDI commands, 100 pipes, it can be hand-turned or motor driven, it has 4 musical registers, it has true Vibrato and Tremulant effects, a Glockenspiel can be attached, and there are 6 percussion effects. All this in a unit that can be loaded single-handedly into an estate car! Plans for this organ have been completed - see the Topsy 3 Plans page - and this package has now been added to the others on the Ordering page. You can see and hear John's completed version performing on YouTube by clicking here. You will also see details of the extra features included in the Topsy 3 Plans package.